Many of the legislative and agricultural issues we deal with are similar throughout the northeastern states. At the recent Grange Leaders Conference in New Hampshire the legislative and agriculture directors began work on an outline of issues we can work on jointly. Several years ago it was the Grange that got the legislatures in all the member states to pass the Northeast Dairy Compact in identical form. Now it is time to work together again to accomplish our common goals. The National Grange has published a position paper known as the “Blueprint for Rural America” for several years. We are now ready to draft a similar position paper focusing on the issues affecting the northeastern states including land use, dairy support, agricultural trade with other countries, food security, environmental issues, energy alternatives, transportation, health care and voter issues. We have established a web site at northeast.mygrange.org where we will be able to make the Grange’s position on these issues available to both members and non-members. A new program, developed at the Leaders Conference, is designed to get younger members more involved in legislative issues. Any youth member, defined as anyone under the age of 35, may choose a legislative issue they would like to pursue at the local, state or national level. The youth member will lobby for their issue, either individually or in cooperation with others, by contacting their legislators at the appropriate level and testifying in support of their cause. Then they will prepare a notebook describing what they have done, supported with testimony they have submitted and letters they have both sent and received which they will submit for judging. Entries must be received no later than June 30, 2008. Entries from all of the northeastern states will be judged at one level; there will not be any Pomona or State run-offs. The winning entry will receive a cash prize of $250, second prize will be $100 and third prize will be $50. More details will be announced through the Youth Committee in each state. The National Grange will not be hosting a legislative fly-in program in Washington this year, so the northeastern states will hold our own fly-in program. We will meet May 3 at the New Hampshire State Grange building to review the issues we will discuss with our senators and representatives in Washington. We will meet with National Grange Legislative Director Leroy Watson in Washington on May 12 for an update on the National Grange’s legislative issues and then meet with our senators and representatives on May 13. Any members interested in joining our trip to Washington are welcome, but everyone will be responsible for all their own expenses. The 2007 Farm Bill will be one of the major issues we will discuss in Washington. The House and Senate have each passed their own version of the farm bill and a conference committee has been appointed to compromise the differences and draft a bill that both chambers will accept. Then the bill will go to the President where it faces a possible veto. Both the House and Senate versions of the bill contain many good features, but the big stumbling block is the differences in agriculture in different parts of the country. This is a situation where a program that works well in one part of the United States is not suitable for other parts of the country. Many compromises will be needed before the bill is in its final form. Some people are already wondering whether the bill will go before President Bush or his successor. Throughout this article I have frequently referred to Northeast and have avoided any reference to New England. 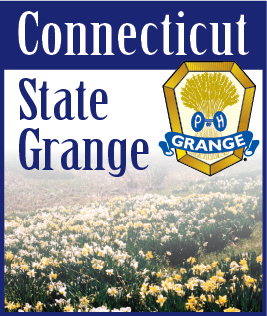 The New York State Grange was invited to join our Leaders Conference this year as they will be helping to host the National Grange convention in Connecticut in November. They were so impressed with everything the Grange is doing in the six New England states that they accepted our invitation to become part of all our regional programs. The conference attendees voted to change the name of our conference to the Northeastern Grange Leaders Conference and all of the committees are expanding their regional programs to include New York as one of our Northeastern Grange states.